My thoughts on where Der Eisendrache's story is going. The O4 as we know them now (the giant) are "Quantum superimposed" similar to the lutece twins in Bioshock infinite. This means that ALL versions of these 4 characters have been stripped from multiple timelines and forged into one set of bodies. This would explain how when they enter worlds where they shouldn't exist, like the giant, the 4 start reverting to a different personality. Richtofen says that each time he kills himself, a piece of him dies too. Maxis has them journeying on to fix the damages otherwise caused by richtofen, maxis, or 115's influence in other worlds, killing many dimensions in the process. Now we move onto Der Eisendrache. I don't think this map is what we think it is. It's called griffin base, which we assumed meant that it's THIS universe's version of Griffin station. However certain elements of the map can say otherwise. Those Dragon heads are similar to the mob of the Dead beast heads. In fact I even bet they function similarly and unlock the bow somehow. However, they were never scientifically explained in MOTD. It's hard to see ANY science behind them. In MOTD what explained it was that the hounds were from hell. (3 dog heads, brutus, that whole spiel). Now here's the kicker: what if Der Eisendrache is IN hell like MOTD. I guess this really WOULD make this a SUICIDE mission. Lets assume for a minute that in THIS universe the O4 had died on the moon. Then the Origins 4 come in via crazy multi-world nonsense to a world where they're already dead. 1- The O4 don't realize they're dead here and continue on until they learn the truth and escape similar to the Weasel or something like that. 2-The O4 KNOW they're dead, and have done this before. It'd make sense to come here, after all if they DID kill older richtofen in "The giant" THIS might be the place to get some answers out of him, if they can find him. My hunch is that the O4 will become trapped here, or something else will happen that's not good for them. 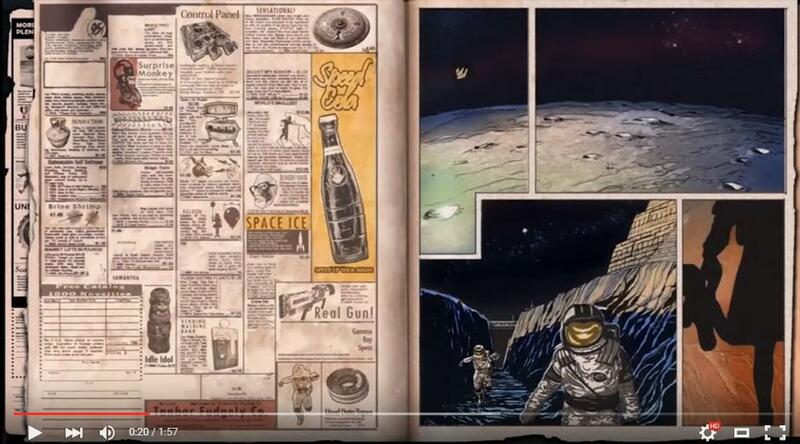 Blundell said that this map would tie up some storyline mysteries, but what mystery would be better then finding out the fate of the ORIGINAL characters last seen on Moon. But I don't think this is the last we'll see of the Newer O4. Perhaps... In the next DLC... We'll see the N4 come back and save them? This is just something I'd want to see, as I really didn't mind Marlton, Misty, Russman, and Samuel. They have their own questions that need answers, and it'd be cool to see how Maxis would recruit them and what happened to them after Buried. Given the connections to MotD I won't rule out hell as a possibility, what would really determine for me though is the appearance of the box in the map as that has been a pretty good indicator of where we are. I was also wondering about a quote from Dempsey in the trailer where he references time-space being ruptured (or something to that degree) and it makes me wonder seeing these features from previous maps plus with one of the specialist weapons looking much more medieval and the other more high tech that it makes me think things from previous maps (or time in general) is bleeding through the different universes and converging at this location for some reason. I believe that's one of the reasons the O4 are here, as it is known that are currently trying to "correct" the original timelines and whatnot. I predict we will launch V-115 Rocket to the Moon and kill the original characters that are on the Moon and after that the crew will continue their search to find Samantha possibly by collecting a artifact of importance from a another dimension trough a dragon. 100% agree on this except for the dragon part, I think that the dragon will just be a gimick to getting the bow like the dogs in MOTD for the retriever. But it isn't a V-115 Rocket like the ones from Moon, the original characters aren't there until the 60s are in fact still asleep (also they wouldn't ever go there, Richtofen never got to begin his grand scheme in this timeline) and Samantha is in Shangri La in this timeline, which I am sure Richtofen knows because of his knowledge and quotes in the Giant. In my opinion, this map isn't hell. Mob of the Dead was a purgatory state, although it was in actuality stuck in a time loop as well. This map doesn't seem like hell to me. The dragon heads aren't Cerberus, they could be anything at this point, maybe even just breaking down the walls from their dimension to this one because of the fabric of the universe being weak here. There's a good explanation for what I mean in Futuruma, where they go to a parallel world and Fry says "2 years later I proposed to her and gave her a diamond scrunchie", then the original Fry says "2 years later I went to a Neil Diamond concert and got punched by a guy named scrunchie." I am not sure how to put it into words, but that quote explains that kind of thing. I think the O4 are here to end their part of the story, they have been told by Richtofen (at least while he was still sane, I am not sure of his mental state at the moment) that they are going on a suicide mission. But he really means that, he even has a note on SoE saying that they all must die. I think that we will use the teleporter to get to the Moon and it will only be the chamber with the MPD at the moment, which will contain Maxis. I think that the main EE will revolve around getting him out of the MPD and using the Summoning Key to put the Shadowman in it. Oh and something will happen at the end where the O4 will die and four new characters will be revealed. Well in my opinion in the current way the zombies story deals with time eliminating Richtofen in The Giant didn't change anything in the dimension of the old crew when they went to Moon. The Origins O4 are jumping from dimension to another killing themselves multiple timelines and dimension. Killing the O4 in Moon would be just yet another loose end wiped out for them. We know from the gear they are wearing that they have been in the future before Origins (radios with coiled wires etc.) I think the V-115 Rockets in Griffin castle are capable of "teleporting" and as such striking into another dimensions. I agree with you that the map is not in hell but the Dragon could be a link to a dimension similar to hell. I don't think you understand what I am saying. The Original O4 are not on the Moon until at least after 1961. Killing them on the moon would be impossible. Also the Origins tech they have is just because they are from a diselpunk world, they haven't been to the future before that. Also they aren't V-115 rockets, it says that nowhere on them. If you can find a link to dragons and hell, I will believe it. Well at this point all I'm doing is mad speculation of course and Griffin Castle being on top of huge Element 115 location kinda would suggest they were using it in rockets. If the rockets are multidimensional it doesn't matter whether the O4 are on Moon at this point or not as the rocket would strike at the point in time they actually are there. Also I didn't say at any point that the dragons are from hell but that they are from different dimension maybe similar to hell like the dog in MotD. Oh I thought you meant a dimension that is like hell, fire and all that. I mean, I already said they were from another dimension somewhere. It just seems weird that we would go to another dimension to shoot rockets through dimensions at the moon, when they were used to advanced the German war machine. Maybe to blow up the moon so the MPD is destroyed (only in that universe though, multi dimensional rockets is really far fetched). Yeah just throwing some wild ideas out there. What makes me to go towards the idea of multi dimensional rockets is that I don't think Griffin Station would exist on the dimension Der Eisendrache is. But I could be completely wrong of course. Well from that new moon loading screen, it seems that part of Griffin Station still exists but not the biodome. Yet when we see those green screens, it has the biodome on it. In this dimension, Griffin Station seems to exist because of the version of Richtofen. Maybe we destroy Griffin Station, or at least part of it like the biodome, hence why it isn't there in the 60's? Because of that quote I instantly understood what you're trying to say as that show is probably one of, if not my favorite show ever. It had a way of explaining super complicated concepts that (no joke intended) were way ahead of its time. And applying that to the current zombies story just made a bunch of things make a whole lot more sense to me. I can totally see where the story with the DLC maps is going now. I'm starting to see a patern here in these weird maps made by blundell. MOTD focused heavily on the religion of older Christianity. Origins focused on the beliefs of the ancients and Argartha. I'd start by researching a religion I just looked up called "Dragonoph" which doesn't have anything PARTICULARLY noticeable to Der Eisendrache, other then the base of worship is a castle that looks similar, the Ritual of Life, and you have to fight a dragon to gain access to the afterlife. But still, you never know. 1-That rocket is NOT going to the moon by any means. 2-The dragons don't appear to be ripping through time and space, they appear to be summoned by fire. This may have some sort of significance with the castle, or the summoning key, or something. But I don't see inter dimensionality to be the key to those beasts. I see it being unexplainable blood-magic. 3- The emphasis on suicide mission is clear, but considering we've LITERALLY seen richtofen kill himself, I DOUBT this is the last we'll see of the YO4. That being said, I'd think it'd be a good choice for the second DLC to star characters OTHER then the O4, assisting them on their quest. It'd be unfruitful to re-use the SOE characters, or hire more actors. However, as I've stated many times before, the N4 could make an appearance here. 4- Something is wrong here on this map. Call it intuition. But whatever it is, it wasn't caused directly by 935 or whatever group was here. This is something ANCIENT. I liked the example where they go to the edge of the universe and look at their alternate dimension selves wearing cowboy hats.